I typed the title of this post and then paused, slightly stumped by the fact that most of my life is made up of book memories. That is what happens when you are a book obsessive from birth onward. If I wrote about all of the memories that come to mind we could be here for days. I will spare you that and stick with what originally inspired the title. You can thank me for my restraint in the comments. It was book fair week at my daughter's school. Just like when I was a child, book fair week is also the week of parent-teacher conferences. And just like when I was a child, the kids are taken down to look at the books but they are not allowed to buy. They have to bring money in the next day. Somehow that manages to heighten the excitement and anticipation. Or at least it does if you are a bookish child like I was. I always loved the moment when we were taken down to the gym and we filed up onto the stage to look at the tables full of books. I don't know why they were set up on the stage. It was crowded and hard to navigate but that was just one more thing that made it exciting. Most of us were never on the stage, and if you were like me, you never wanted to be unless it was to look at books. The stacks of books were neatly arranged on the tables by grade level. It was kind of like a treasure hunt. You would circle the table, never sure what books you were going to see. Many of them were completely uninteresting but sometimes you would find just the book you didn't know you wanted. Reading this over, I am starting to think I was a slightly strange child. Yes, I really did find book fairs this exciting. I don't remember all the books I bought. I know when I was little I bought some of the picture books that came with the little records of the story. Remember those, back in the days of record player? They were 45s I think, and you had to insert that plastic disc in the hole in the center so the record would fit on the spindle. Then you would lie down on the floor right in front of the speaker and listen to your book while following along. There was always a sound to tell you to turn the page. I remember I had Black Beauty and Tootle the Tugboat, I believe. Then when the story ended it would make that repetitive noise of the needle bumping in the groove at the end of the record (I don't know how else to describe it, but I can still hear it) until you would pick up the needle and drop it down at the beginning and listen to the whole thing over again. The book I most clearly remember buying is The Witch of Blackbird Pond by Elizabeth George Speare. I had looked at it when my class had visited the sale because I liked the cover but I didn't want a book about a witch so I put it back. Later that day my mom took us back to the book sale and she picked up the same book. For some reason, I can still see her standing beside the table and flipping through the book. She handed it to me and told me she thought I would enjoy it, that it wasn't really about a witch. She was right, I did like it. I loved it, in fact. I loved the story of Kit Tyler who comes from a Caribbean island to live with her Puritan relatives in Connecticut. I loved her feisty personality, I loved how she stood up for the "witch" and I really, really loved the romance with Nat. I am not sure how old I was when I bought this book but I know I was in elementary school, fourth grade, maybe? Romance was new in my books and I was enthralled. My daughter brought her allowance into school today and bought a book. It isn't anything as special as The Witch of Blackbird Pond, at least in my opinion. It is an activity book with an annoying title that I can't remember right now, but it doesn't matter. She was excited, she had the anticipation and the fun and the decision making that I remember. She is making her own book memories. I find this to be such a lovely post! It put a smile on my face. Nothing beats happy childhood memories. I wish there was a book fair week when I was growing up at school. 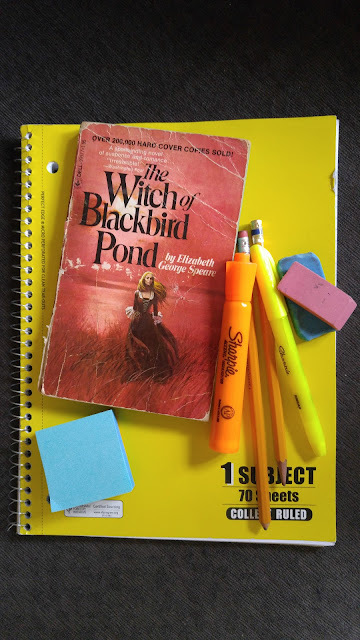 Is this copy of 'The Witch of Blackbird Pond' in your picture the same one you bought in elementary school? If so, wow. It's wonderful to have a tangible reminder of these happy memories. It is the copy I bought all those years ago, I hate to think about exactly how many years that is! That is one of the lovely things about books, it is not only the story that brings back memories but also the acquisition of the books and sometimes the memories of when and where a certain book was read.